Before deciding to make an offer on the bungalow I went to talk to the local planning officer again. We needed to know what the planners' reaction might be to a strawbale wrap and extension of the bungalow. The short answer is "mixed". Normally, within certain criteria to do with size and materials that match the existing structure, side or rear extensions are covered by "permitted development" rights. As long as you meet the criteria you can go ahead and build once you have building control approval (to ensure the construction meets current standards). As Bridport lies in an Area of Outstanding Natural Beauty (AONB) all side extensions here need planning permission, as do any that don't match existing building structure. So straight away, our project quite rightly does require planning permission. This is then more likely to be given if the plans still comply with the restrictions normally covering permitted development. Our plans clearly won't... The planning officer was extremely helpful and generally supportive, but of course he has to work within the guidelines and regulations governing planning and development. He explained that the main problem we might have comes down to the visual change from a brick bungalow (in a street of brick bungalows) to a rendered one, as the strawbale walls will have to be rendered. He said that just extending with straw, but leaving the main building as brick would probably be fine, but was hesitant about the wrapping of the whole building due to the conflict of this with the guidance that development should be in keeping with surrounding structures. At the same time, the planning officer did say that if we just painted the whole bungalow there was nothing anybody could do to stop it, and he accepted that would change the appearance as much as rendering the new bale walls would. But as we have to apply for planning permission, all the guidelines have to be considered. He also pointed out that these days the planners encourage new developments to be varied, so that the situation never arises that a street is full of near identical homes and any changes stand out. Overall I got the impression that he wanted to be supportive and understood that our plans fulfilled some of the broader aims of the planning system to encourage sustainable and low-energy development. Ultimately he just cautioned to "be very careful" about the wrapping and the way it would change the outward appearance from brick to render, which would make it a very different home to those around it. I initially came away feeling very discouraged. On our first visit to a planning officer to discuss strawbale we'd essentially been told "not in a conservation area, where appearance and materials has to closely match existing buildings, but fine anywhere else" (see Conservation Conversation) and now we seemed to be being told more or less the same thing for outside conservation areas too. It seemed especially absurd as frankly the bungalows are not the most beautifully designed things I've ever seen. That said, I do agree with the point of creating buildings that are sensitive to their surroundings, I just don't think that means they have to identical. 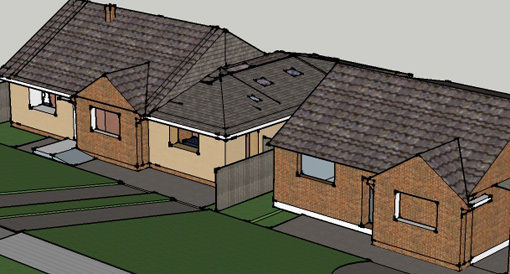 Which brings us to our compromise solution - yet to be put to the planning people - and the front projecting bedroom which we've left as brick in the plans (see rough design sketch above - left-hand bungalow). This will make life more difficult in terms of producing a continuous insulation barrier around the home (we will have to internally insulate here, probably with timber stud frame filled with sheeps-wool or cellulose insulation), increasing chances of thermal bridging around the joins of brick and bale walls. However we think it will also maintain a clear visual tie between our bungalow and the ones on either side of it, so it's worth a few design complications. The gable end of the projecting room also has some attractive quoins built of clay tiles, which are a surprisingly nice detail in the bungalow's original design, and leaving this part out of the bale wrap leaves them on display. We want to end up with a highly efficient, comfortable home, but we also want it to look good and to fit in with where it is. Hopefully the planning committee and our neighbours will accept our solution.